Generations of women have contributed to engineering, and Clark School women are proud to be part of that tradition. In honor of women’s history month, the Clark School is celebrating one female engineering faculty member each day. Read about today’s featured faculty member, Sarah Bergbreiter. 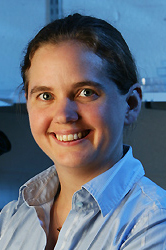 Sarah Bergbreiter is an Associate Professor in the Department of Mechanical Engineering and Institute for Systems Research. She is the current Director of the Maryland Robotics Center and directs both the Micro Robotics Lab and the multi-user Robot Realization Lab. Bergbreiter received her B.S.E degree in electrical engineering from Princeton and her M.S. and Ph.D. at Berkeley. She joined the University of Maryland in 2008. She is the recipient of a Presidential Early Career Award for Scientists an.d Engineers (PECASE); an NSF CAREER Award for "Microrobot Legs for Fast Locomotion over Rough Terrain”, and a DARPA Young Faculty Award. Her microrobotics research has been featured in the NSF’s Science Nation online magazine and IEEE Spectrum among others. She has also given a TED talk at TEDYouth 2014 on her work. This presentation has reached over 1.4M views so far. She has also been named one of 25 women in robotics you should know about. Her research interests are in microrobotics, micro-electro-mechanical systems, microactuators, soft robotics, robot locomotion, networked centimeter-scale robots and millimeter-scale power systems. Drawing inspiration from insects, Bergbreiter studies tiny robot dynamics and develops submillimeter-sized mobile robotic platforms that could be used for surveillance, monitoring structural safety of buildings and bridges, microsurgery, delivering drugs through the blood stream or for search and rescue missions. She has mentored over 50 undergraduate students, 6 MS students, and 11 PhD students while at Maryland.